Newham is an up and coming borough benefiting from significant regeneration investment. Rentify can help you make the most of your letting with our handy borough guide. At Rentify we have property specialists dedicated to Newham, armed with local expertise and unmatched valuation knowledge to find you the right tenants. As a host borough to the London 2012 Olympics, the London Borough of Newham has gone through a period of immense change. Millions of pounds of investment has been poured into regenerating the borough, including the construction of the East Village development. One of the largest urban shopping centres in Europe has opened in the form of Westfield Stratford City, attracting millions of shoppers to its high street name stores and popular restaurants. Elsewhere in the borough, the ExCel Centre hosts a wide variety of exhibitions and conventions, and London City airport provides easy access to national and international destinations. In preparation for the Olympic games, transport options in Newham were significantly upgraded. The borough is served by the Central & Jubilee lines, mainline rail services, and Crossrail will call at several stations from 2018. Newham offers much more in the way of semi detached, detached and terraced housing compared with other London boroughs, which are great for families. Yet there are still plenty of flats available for single professionals and couples seeking a quieter life. Newham's many districts each have their own character, catering to a variety of residents. Here's our top picks for new landlords in the area. 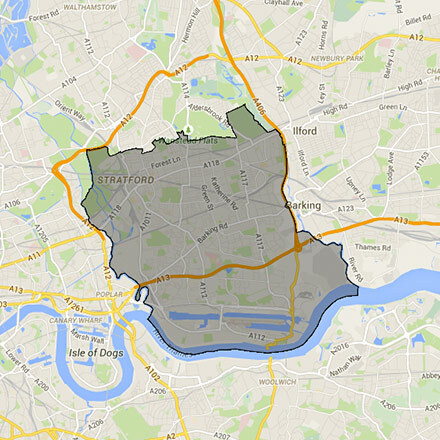 This borough covers the E12, E13, E15, E16, E20, E3, E and E7 postcodes. Rentify uses proprietary methodology for data collection and processing. Borough data is collected from Rentify's property database and external public sources.